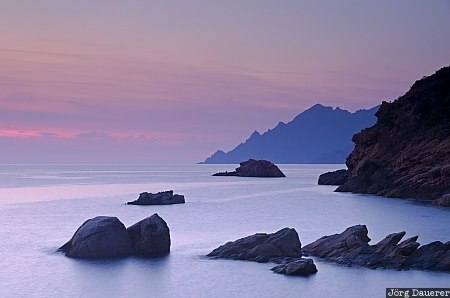 The mediterranean sea at the Gulf of Porto with its rocks and surrounding mountains back-lit by a colorful sunset. The water of the mediterranean sea seems to be calm due to the long exposure time of 4 seconds that had been used. Porto is in the department Corse-du-Sud, France on the mediterranean island of Corsica. This photo was taken in the evening of a sunny day in September of 2011. This photo was taken with a digital camera.